FORMALDEHYDE (methanal) is the simplest aldehyde. It is widely employed in industry for wide range of applications. Formaldehyde is also used as a disinfectant and is a commonly utilized tissue fixative and embalming agent. Formaldehyde is naturally present in all tissues and body fluids. Recently it has been shown that some cancer types exhibit elevated formaldehyde levels. Increased formaldehyde concentration in urine has been associated with prostate and bladder cancer. Thus, measuring formaldehyde in urine can be a very useful tool when studying cancer. 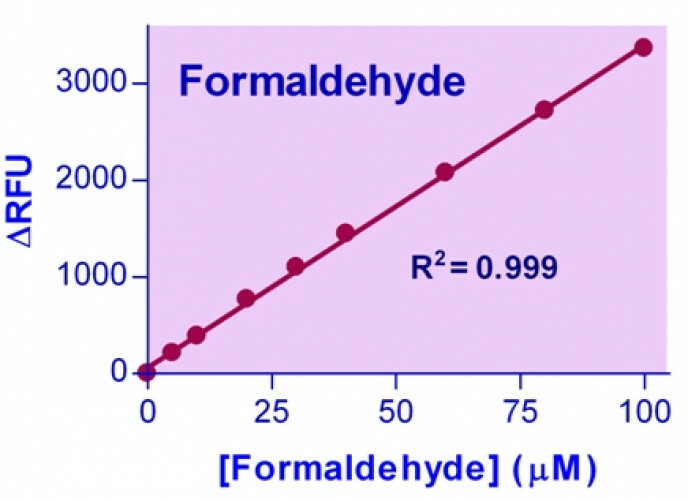 BioAssay Systems' newly designed Formaldehyde Assay Kit provides a convenient fluorimetric means to measure formaldehyde in biological samples. In the assay, formaldehyde is derivatized with acetoacetanilide in the presence of ammonia. The resulting fluorescent product is then quantified fluorimetrically (λexc/em = 370/470nm). The assay is simple, sensitive, stable and high-throughput adaptable. 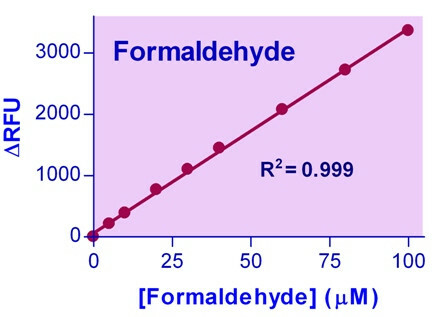 The assay can detect as low as 1.5 μM formaldehyde in biological samples. References Assay: CSF in Monkey (Pubmed).